Bal Fell is a large shrine to Sheogorath on an island in the southern sea. It is divided into four sections: the Outer Shrine, West Wing, East Wing and the Inner Shrine. There are some Telvanni patrolling outside, and a couple of groups from the Mages Guild inside. There are also some dead scamps lying around, indicating that the mages have had some success fighting off the Daedra. There is some good treasure within the Inner Shrine, including a grand soul gem, and the locked chest on the altar has the unique Ten Pace Boots. "Bal Fell" translates to "City of Stone". The book Breathing Water makes it clear that the ruin was once a thriving city in the Second Era. 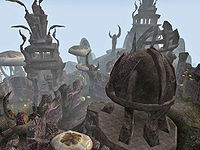 The book Before the Ages of Man states that Bal Fell was one of the towers on Vvardenfell built by Aldmeri explorers in the middle Merethic Era. This Inner Shrine is unusual in that none of the items or containers near the altar are cursed. It is illegal to sleep in Bal Fell.